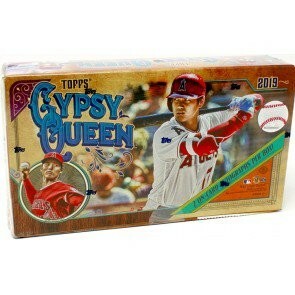 Gypsy Queen Baseball is back in 2019, just in time for the MLB Opening Day excitement. Featured in 2019’s product will be an extensive Base Card set, thematic photograph variations, unique parallels, and unannounced hidden gems! 2 Autographs Per Hobby Box! This year’s Gypsy Queen release will exclusively showcase active MLB veterans and rookies in its comprehensive 300-subject Base Card set. Collect the biggest early season 2019 rookies and veterans while searching for unannounced parallels and hidden gems. Images of the game’s biggest current stars wearing iconic “42” jerseys in tribute to Jackie Robinson. Exclusively featuring retired players and all-time greats! Limited. Featuring “predictions” set to occur throughout the 2019 MLB season. Exclusively featuring current stars in their Player’s Weekend uniform. Inspired by antique tarot decks, showcasing colorful art paired with today’s biggest stars. A mini autograph set exclusively featuring the top 2019 rookies with on-card signatures. Sequentially numbered to 99. Power Performers Portrait Art Patch Originals NEW! Featuring multi-color patch pieces of the top power performers in the game. Numbered 1/1. Gypsy Queen Chrome Box Topps HOBBY ONLY! NEW! Individually-wrapped chrome cards showcasing design work of the Gypsy Queen era. Featuring today’s biggest stars and rookies. One 3-card pack per box!